Her parents wanted her to have a normal life, but Eryn had no idea what normal was. Now that they were missing, or "dead" as the Council said she had to tell everyone, she was living in Redgrave with her uncle. A town that isn't supposed to have anything paranormal going on at all, so she can just blend in. Well, something is definitely up in this town! Eryn is sure she just saw a werewolf, and as time goes by she finds herself knee-deep in a whole lot of paranormal, and caught between resident bad-boy Alex and town hottie Wade. These boys are most certainly Under My Skin (Skinned Book 1). Eryn is going to have to decide which side she is on, and who is hiding the most from her. Judith Graves writes a coming of age, doing it on your own, who is telling the truth story. 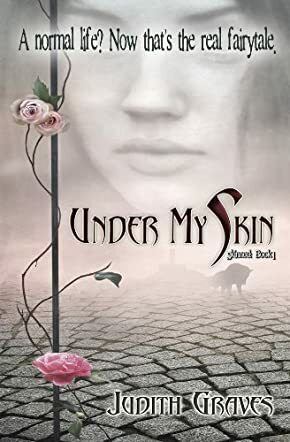 Under My Skin is paranormal, so you get the werewolves, vampires, wolven, and werewolf hunters. Then you have a Council that rules the paranormal community, and those who no longer respect the Council. So not only do you have the teenage story of the two guys after Eryn, you have the paranormal aspect; then there is a third more adult layer that makes this book wonderful for all ages. Judith Graves does a great job in combining all these layers and making a complete story that is fun, entertaining and enjoyable for readers of all ages and levels.